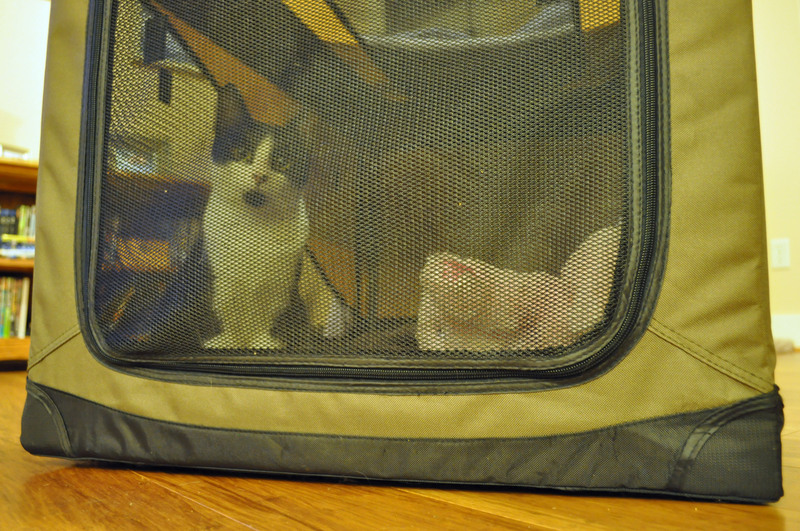 Soooo … we are officially two weeks into little Colby’s incarceration in the crate from hell. At least, I am assuming that’s how she thinks of it. Especially given her reaction over the weekend and through yesterday. During that time, she repeatedly let me know just how irritated she was with all of this by burying her water bowl with litter. Because I managed to find a water bowl she could not dump. So, instead, she buried it. Until it became a solid, clumping mass. Yesterday, instead of burying her water, she somehow managed to toss it out of her water bowl without tipping anything, and soaked all of her bedding in the process. I’m not entirely sure how she managed to soak all of her things with just a quarter cup of water, which is all I have allowed her to have at one time ever since she let me know that she liked dumping the bowls, but she found a way. Today, she has been relatively quiet, just snuggling with her stuffed animal. Yes, she has a stuffed animal. Actually, she has two. It’s a trick I learned at Cat Adoption Team, where we often place kitten-sized, floppy and soft stuffed animals in cages to comfort youngsters who are all alone for the first time. It works with them, so I figured it would work with her. Colby quickly adjusted to the stuffed animal in the upstairs crate, wrapping her front legs around it as she slept and keeping it safely on her bed. The one in the downstairs crate, however, is apparently not her favorite. She has kicked it out of her bed, tossed it in the water bowl (sense a theme here? ), and used it to help bury smells coming from her litter box. I’m not sure exactly what she finds so distasteful about it. It is made of the same material and is the same size as the one upstairs. The only difference is the one downstairs is a white lamb and the one upstairs is the pink bunny. Anyway, we have at least two more weeks to go before I can take her back for another X-ray to check on the progress of her leg. I am crossing my fingers that it heals very, very quickly. Colby in her crate. 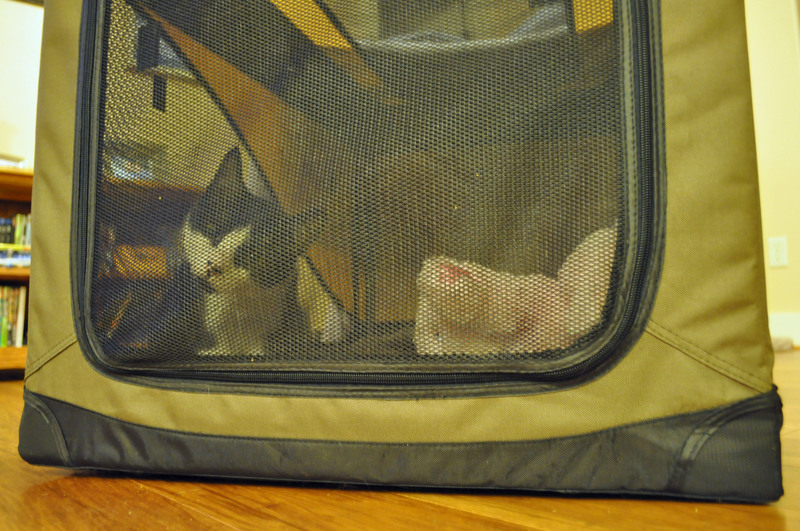 The pink bunny is on the right side of the crate.